Have you ever noticed how expensive trail mix is when you buy it from the store?! It’s outrageous, which is why we’ve been making our own for years. Trail mix is a great snack and the perfect traveling companion. Whether you’re going on a road trip, hiking in the mountains, or zipping around town on your bicycle, it travels well and is generally one of those snacks enjoyed by all. We’re sharing this recipe not because we don’t think you are capable of throwing together some nuts and seeds but because this is one of our absolute favorite combinations. 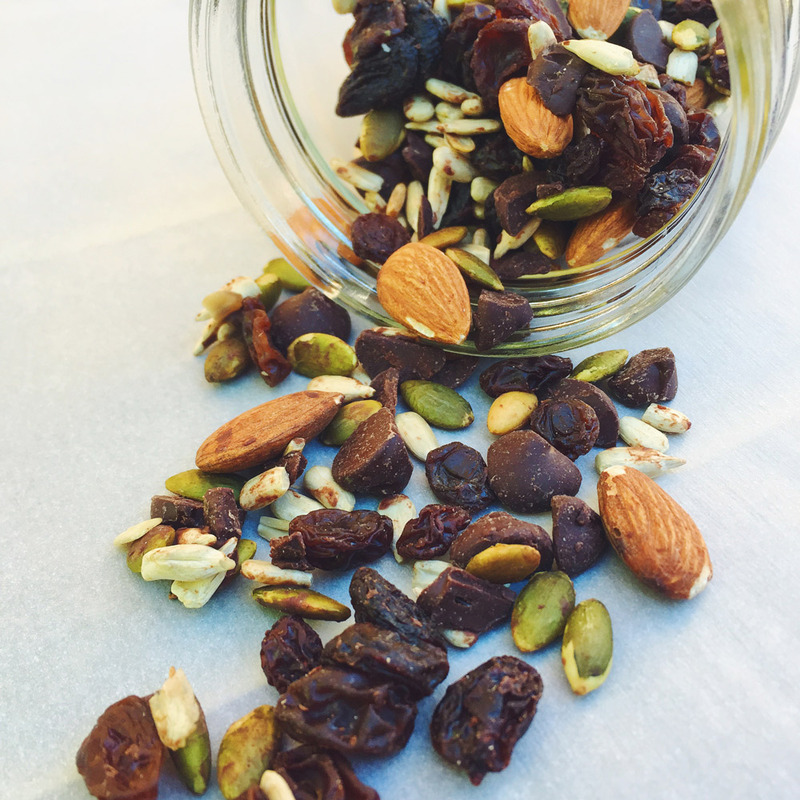 We like to think of this recipe as a more sophisticated version of traditional trail mix! Be sure to let us know your favorite combination, as we are always looking for the next best thing! Toss the pumpkin and sunflower seeds onto a baking sheet lined with parchment paper. Lightly salt. Roast for 10 minutes or until golden brown. Allow seeds to cool completely! This is an important step otherwise your chocolate will melt. After the seeds have cooled completely combine the rest of the ingredients in a large bowl and mix together. Add sea salt to taste. Store in an airtight container for up to one month. Voila! One of healthiest and tastiest snacks!